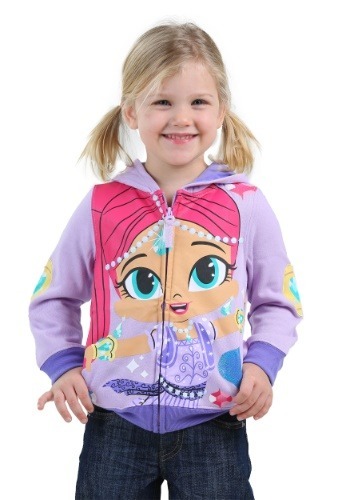 Make your little girl's biggest wish come true and gift her with this adorable Shimmer hoodie! Shimmer grants wishes, sports tons of sparkly bling, has gorgeous long pink hair , and on top of all that, she's also magical! It's really not a surprise that little girls are charmed by this bubbly and bright animated genie, so it's certain that they'll love zipping up a Shimmer costume sweatshirt before they venture outside. Whether they're headed to school or the enchanted land of Zahramay Falls, they'll feel giddy when they look down and see Shimmer's encouraging smile! The Shimmer & Shine costume hoodie is made from a cotton/poly blend and features a printed design that little girls will instantly fall in love with. The jewels are decorated with specks of glitter as well as the appliqued patches on the elbows, so your little one will feel like she's been granted a wish from a spunky genie whenever she wears it!